BATH — Studio Theatre of Bath will present a Festival of New Works for one weekend only, April 26-28th at the West Bath Fire Department Function Hall, 192 State Road in West Bath. The Festival of New Works features the world premieres of three unpublished, previously unperformed one act plays. The Festival is the first of its kind for Studio Theatre of Bath. Studio Theatre of Bath put out a call for submissions for the Festival of New Works in December 2017. They received over three dozen original one act plays, written by playwrights around the world. The three featured plays are very different in tone, style, and theme, providing the audience with a well-rounded evening of theater. “The Chicken or the Fish?” by Katherine Russo, directed by Benjamin Proctor, is a fast-paced comedy that looks at the traditions and expectations surrounding marriage. The cast includes: Joel Biron, Belle Bouthot, Ellie Hawks, Tracy Kapocius, Billy Rankis, and Vince Shatto. “Battle of the Sexist” by Steven Hayet, directed by Marc Rodriguez, uses humor to examine how the media spin and how one comment, taken completely out of context, has the potential to ruin a career. 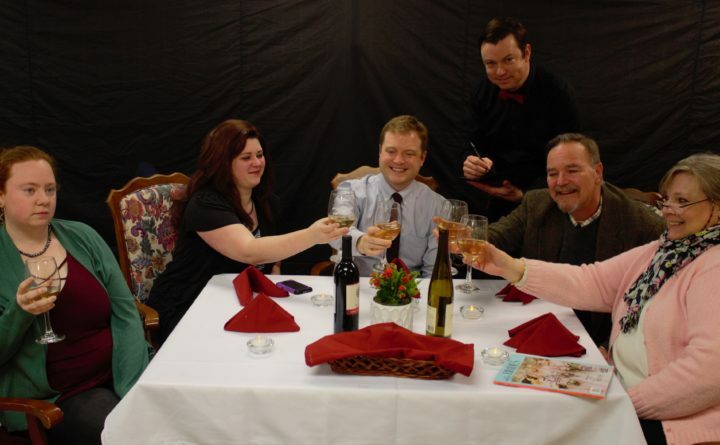 The cast includes: Garret Coffey, John Conrad, Sandi Panati, and Sararose Willey. “Who Will Cry for the Cockroach?” by MK Wolfe, directed by Heather Guglielmo, centers on an old fashioned radio play about how one man’s seemingly small actions can change the world forever. The cast includes: Johnny Aday, Letia Fowlie, Kat Loef, and Andy Shatto.